LaVonne Marilyn Draeger, 84, of Hutchinson, formerly of Glencoe and rural Stewart, died Tuesday, Dec. 29, 2015, at Harmony River Living Center in Hutchinson. Casket bearers were Corey and Anna Draeger, Stacey and Nathan Bipes, Jennifer and Josh Klukas, Chad Draeger, Philip Grochow, Gregory Grochow, John Klaustermeier and Mark Schuette. Honorary casket bearers were her great-grandchildren, Gabrielle, Madeline and Makenna Klukas, Gavin and Sloann Bipes, and Lillyanna Draeger. LaVonne Marilyn Draeger was born Jan. 26, 1931, in Penn Township, McLeod County, to Alfred and Annette (Groth) Schuette. She was baptized as an infant on Feb. 15, 1931, and was confirmed in her faith as a youth on May 20, 1945, at Immanuel Lutheran Church in Brownton. She received her education at Immanuel Lutheran Parochial School in Brownton. On Oct. 4, 1950, she was united in marriage to Raphael Draeger at Immanuel Lutheran Church in Brownton by the Rev. R.W. Koepp. Their marriage was blessed with two children, Brian and Brenda. The Draegers resided and farmed in Round Grove Township until retiring in 1985. They shared 42 years of marriage before Mr. Draeger’s death on June 4, 1992. Mrs. Draeger moved to Glencoe in 1993. She was a loving wife, mother and homemaker and partner in the farming operation. 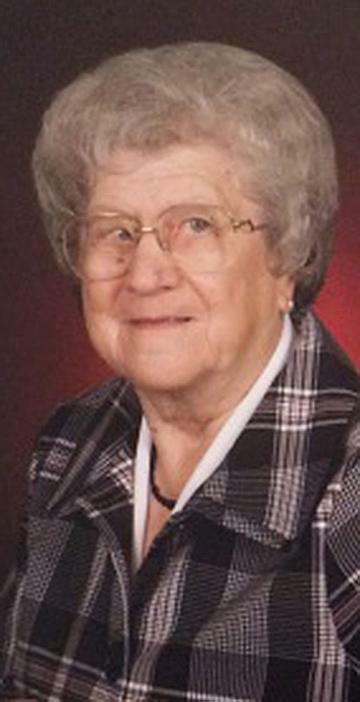 She was a member of St. Matthew’s Lutheran Church in Fernando, rural Stewart. She also was a member of the ELCA (Fernando), Home Extension Club and the 4-H Club. Mrs. Draeger enjoyed embroidery, playing cards, ceramics, arts and crafts, and tending to her flower gardens. She especially cherished spending time with her family, grandchildren, great-grandchildren, relatives and friends. When she needed assistance with her daily care, she moved to Ecumen Oaks Assisted Living in Hutchinson from January 2013 to May 2013. She then became a resident of Harmony River Living Center on May 15, 2013. She is survived by her children, Brian (Debbie) Draeger of Stewart and Brenda (Don) Grochow of Winthrop; grandchildren, Corey (Anna) Draeger, Stacey (Nathan) Bipes, Chad Draeger, Gregory Grochow, Jennifer (Josh) Klukas and Philip Grochow; great-grandchildren, Gavin and Sloann Bipes, Lillyanna Draeger, and Gabrielle, Madeline and Makenna Klukas; sister and brother-in-law, Marlys and Hillard Klaustermeier of Lester Prairie; brothers and sisters-in-law, Gary and Joyce Schuette of Walker and Grant and Bonnie Schuette of Brownton; sisters-in-law, Geneva Loverude of Fairfax and Marlys Zieman of Brownton; many other relatives and friends. She was preceded in death by her parents, Alfred and Annette Schuette; husband, Raphael Draeger; and granddaughter, Tanya Draeger.